A brand NEW concept hoist system with an innovative lifting module IN THE RAIL. 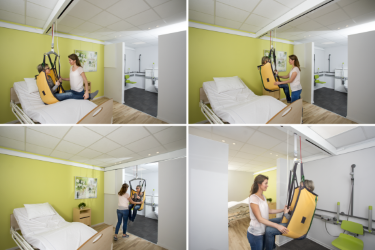 The GHZ is a discreet almost invisible lifting module that ensures safe and comfortable lifts and an ergonomically safe working environment for care staff. The lifting module runs within the traverse rail, minimising the depth dimensions and allowing extra lifting height, which can be a major benefit in rooms with low ceilings. The GHZ utilises the Guldmann wall rail tracking with an all new traverse rail that houses the new GHZ motor INSIDE the rail minimising the built-in dimensions. The GHZ offers an extra 147mm of lifting clearance making it ideal in domestic situations or areas with lower ceiling heights. The sleek simple design is easy to clean and lends itself to being built in to a storage cupboard for a minimal appearance. Coupled with the Guldmann Wall Rails XY room cover tracking systems can be built with up to 5m traverse rails and almost unlimited length of fixed parallel rails. The new special GHZ Flex traverse trolleys will help compensate for misalignment of the parallel walls up to 80 mm. The rails and the traverse trolleys are powder coated white and with the white side covers on the wall rails the installation fixings are concealed. The GHZ hoist system is charged via docking the handset. Maximum lifting capacity is 255 kg. 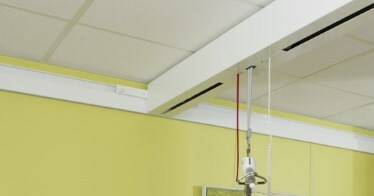 Improved lifting height – compared with other ceiling hoists the GHZ offers improved lifting height.